Outdoor metal planters are durable and often increase in beauty as they age. Whether you love the rich color of copper or the strong industrial look of steel or cast iron—the one characteristic that sets metal garden planters apart is the beauty that aging can add to their surface color and texture. Zinc planters are currently very popular as they add a dramatic, often contemporary, style to any outdoor decor of your garden landscape or on your deck or patio. 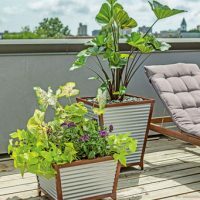 From year to year, as your metal planters age, you will find they can take on a completely different look—providing a new look for container garden plantings and groupings. 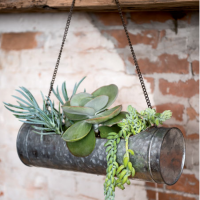 Metal garden planters are often used as ‘cache pots’—decorative containers which hold a planted plastic or resin pot inside. 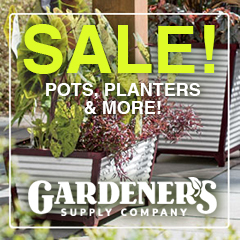 If you have tall or over-sized planters that you don’t want to fill with soil, insert an inexpensive plastic pot turned upside down, then add your planted container. You may still want to ensure the metal cache pot has a drainage hole, so excess water doesn’t pool at the bottom.